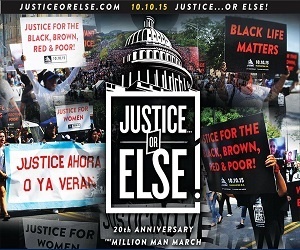 Nation of Islam - 20th Anniversary of the Million Man March 10-10-2015 | ComeSeeTv Broadcast Network ... Can you See me Now! The most powerful weapon in our arsenal is our unity backed by the might of God Himself as this is the time foretold of in scripture as a Day of Judgment, a harvest time for all who have sown evil and who have sown good. We recognize that the Supreme Being is on the scene today and executing his power to punish and destroy the wicked. Our hope is not in carnal weapons of this world but in the power of the Master of this Day of Judgment in which we now live.